In Mozambique, children under five years are at high risk of deadly diseases and conditions such as malaria, pneumonia and diarrhoea. Despite efforts to increase access for rural populations to basic healthcare services, under-five mortality was estimated to be 87 for every 1,000 births in 2013. 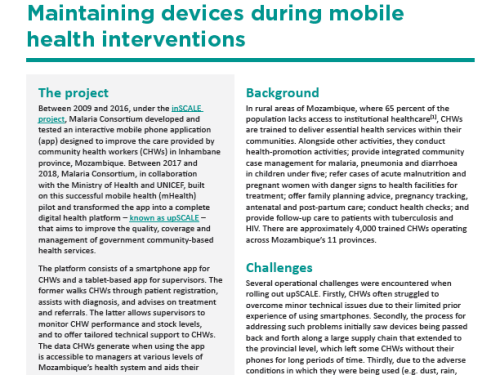 Building on our previous work in Mozambique, this project will contribute to the reduction of maternal, neonatal and child deaths by linking up the work of community health workers in rural areas with the national health information system through mobile phone technology (termed ‘mHealth’). This will be achieved through further development and scale-up of the inSCALE CommCare app– an interactive mobile phone application that guides community health workers through the diagnostic process and transmits data to the central health system. The project will also monitor and evaluate implementation of mHealth solutions in order to better inform stakeholders and decision makers of challenges and benefits of using these platforms.